It is now possible to sign up for the 9th edition of the European WaterCampus Business Challenge (EWCBC). The EWCBC 2018 will be organised from March 12-16, 2018. During this week you will meet peers, talk with innovative corporations and get to pitch for serious investors, launching customers and technology partners. In past editions participation in the European WCBC has resulted in great success stories. Almost all companies from the previous 8 editions are still successfully active in the water business. For the 2018 edition we will again invite startups and PhD with entrepreneurial ambitions from all over Europe to create a big rub off effect and create win-win situations for all. Within the program we unite the forces of (young) entrepreneurs, coaches, investors and innovative corporations to turn new developed technologies into a (commercial) success. The European WCBC is an excellent 5-day training for talented entrepreneurs where they learn how to build good innovative technologies and services into a successful international business. On the last day the participants will present their business plan to a jury of water technology experts and investors. Candidates are selected on the basis of their innovation potential, contribution to sustainability and market readiness. Selected candidates are positioned to become the global front-runner in their field. For the whole week (including accommodation, food and beverages costs) the attendance fee for the participants is € 550,- (excl. VAT and travel costs). This low fee allows startups and PhD to participate easily. The regional government, Wetsus and other partners sponsor the remainder of the cost. Wetsus is the European centre of excellence for sustainable water technology. Wetsus created a worldwide unique environment and strategic cooperation for development of profitable and sustainable state of the art water technology. With Wetsus new water technologies are developed in a unique way. Both universities (>20) and private companies (>100) contribute to the research program. The companies define the research program, which is executed by the universities in the Wetsus laboratory. So far Wetsus has generated over 80 patents and more than 25 startups in the field of water technology (www.wetsus.nl). 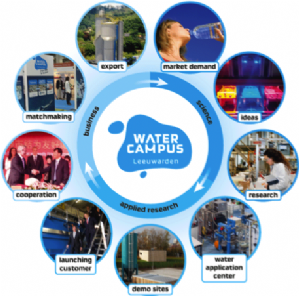 Wetsus is part of WaterCampus Leeuwarden, the European hub for water technology. Within WaterCampus Leeuwarden science, research, business and education in the area of water technology are combined in a unique way. All preconditions that are necessary in order to develop water technology successfully and introduce it in the market, are present.